Today's post is on a product that has been a long standing love of mine. Sometimes I go through stages where as my hair just doesn't feel as clean after drying it as it should do, whenever this happens I turn to Pantene Smooth and Sleek Aqua Light Shampoo to sort me out. It took me a long time to realise that most shampoos that promise moisturised hair and various other claims, generally contain silicone which just means it coats it to make it feel better. This is fine for a special occasion but on a day to day basis these coatings build up and leave your hair feel lank and dirty. 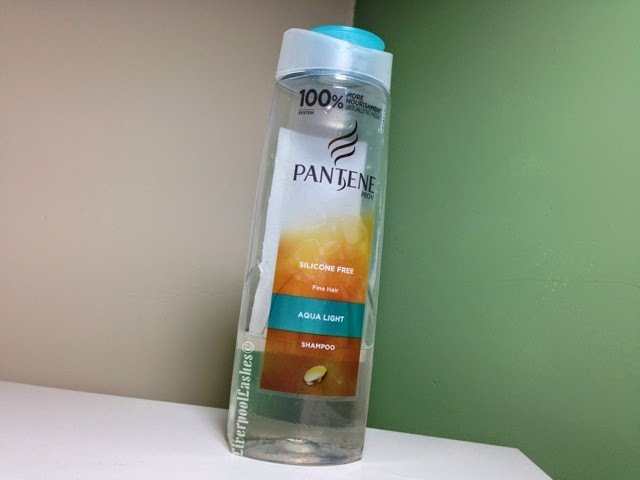 Pantene Smooth and Sleek Aqua Light Shampoo is silicone free so it leaves my hair clean, soft and manageable. It claims to have zero weight to it so it would be amazing on someone with fine hair as well. I like to rotate my shampoo and conditioners every time I wash my hair but I feel like having this in my routine removes any product build up without adding anything. I highly recommend this shampoo, it's been something I've been purchasing for years now despite it's slight name change and packaging but it works a treat!